We R Memory Keepers 3/4 inch BINDING WIRES Black The Cinch 71002-8 at Simon Says STAMP! 71002-8 /2.3 This item is on reserve until If you would like to reserve this item now, you may purchase it now with the rest of your order. We will hold your order now and ship your entire order as soon as this item is back into stock. If you would like your order to ship now, please place this item on a separate order. Success, We R Memory Keepers 3/4 inch BINDING WIRES Black The Cinch 71002-8 has been shared! Making custom books is now a cinch! With We R Memory Keepers Cinch products you can create your own books in just minutes! 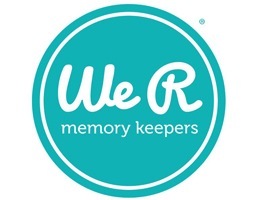 As a 90-year-old company, We R Memory Keepers has evolved into one of the leaders of scrapbook and paper crafting suppliers. We R manufactures high quality, functional, and creative scrapbook products that are specifically designed to preserve and enhance memories that last for generations. Products include innovative tools, quality albums, photo sleeves, page protectors, unique paper lines, and coordinating embellishments.